Obama, whose memoir Becoming hits shelves Tuesday, sat for an interview with Cornish in Chicago earlier in November. She also took questions from three girls who go to Whitney M. Young Magnet High School — the same high school the young Michelle Robinson attended. "Politics was never ever anything I would have chosen for myself. ... It was very difficult being married to a man that felt like politics was his destiny," Obama says. That man, of course, would be former President Barack Obama, who very much altered her destiny. Michelle Obama is a self-described "box-checker," who was even meticulous about how she played with Barbie dolls when she was little. "I like order," she says. "I liked my Barbie dolls neatly kept, don't touch my stuff you know?" She says she would choose the comfort of her house, rather than go outside into the chaos. "Yeah, I was absolutely cautious. And I was cautious when I went out to college." She says she regretted that she wasn't bolder during this time. She went to Princeton, although Obama says her guidance counselor at Whitney Young told her she wasn't "good enough for the place." Obama calls that "planting the seeds for failure," which she describes as "a feeling before it is an actual result." She says that happens often with women, and underrepresented minorities. "It's just that little seed of doubt that somebody says you're not quite ready." But Obama kept on checking her boxes. "Check, Princeton, I got in, good," she says. "I'm going to do well there, and then what? Ah, let me think what should I be, a lawyer." She then applied to law school, and was admitted to Harvard. "I'll go there and now I'll be a corporate lawyer, that's the next thing." Obama says her box-checking was in part because she was somebody "that was staying on the safe course," and also "I couldn't afford not to." In contrast to her orderly box-checking, Obama says her husband was "a swerver." She describes a moment while they were dating. "I'm snuggling, and I'm like, 'What's on your mind, babe?,' thinking he's going to talk about my eyes. Instead, "he'll say something like 'world peace and hunger and you know, fixing the economy.' And I'm like, 'Is that what you're thinking?' "
Obama says it was "a little destabilizing to be a box-checker married to a serial swerver," and that she started questioning herself because she "could feel the force of his beliefs." She worried that she would lose herself. "I felt like, I need to anchor myself in who I was so I wouldn't be this woman following this man. I really felt that I could get caught up in his swerving, that I would just become part of his swerve rather then figuring out my own self. So, yes, it was destabilizing but it was a motivator. ... So that I didn't just become his woman, which I knew I didn't want to be." Once they were married, and after two young daughters, Barack ran for public office, leaving corporate lawyer Michelle at home with the kids — a period Michelle Obama calls "irritating and hard." They wound up in counseling, a point Obama shares in her book, in part, she says, "because people are invested in us as the perfect couple. I thought it was important to make sure that couples know that marriage is hard," and that, "great marriages require work." She says she wants her daughters to know that "Mom and Dad had to work through some stuff. And people you love and people you want to build a life with, you're going to have to work through stuff with." 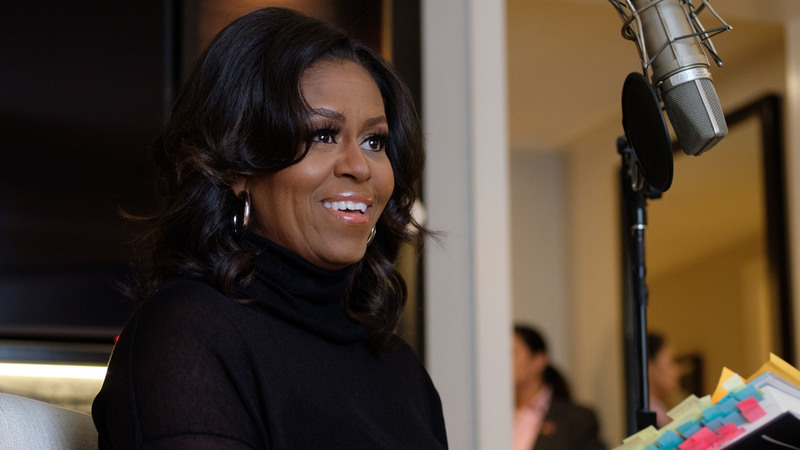 During the first presidential campaign, Michelle Obama drew criticism because of an off-the-cuff comment she made on the trail. "For the first time in my adult life, I'm really proud of my country because it feels like hope is making a comeback," she said. "Not just because Barack has done well, but because I think people are hungry for change." It was the first part of that statement that was used as a sound bite, and Michelle Obama was accused of not loving her country, and criticized for being "an angry black woman." She says she was called "Obama's baby mama, and I put all that down [in her book] because I want young people to know there are highs and lows and rough patches and things you have to overcome." Obama says she doesn't regret the remark, but learned an important lesson, about gamesmanship in politics. "I was coming in there thinking you talk honestly. People want authenticity. But you have to watch every word you say." And being judged as a black woman was part of it, too. Obama recalls an instance as a child when she was visiting relatives and was asked why she was talking "like a white girl." She says, "You are judged in your community because you aren't black enough, then you get out in the world and you are too black." Obama says it is a careful tightrope that "we all walk as underrepresented people." That period in her life, she says, taught her "I need to define myself before others define me." After arriving at the White House and assuming the vaguely defined role of first lady, Obama again took a cautious approach, learning from the experience of one of her predecessors, Hillary Clinton, who immersed herself in an ill-fated attempt at health care reform. Obama says the lesson she took from that was that for a first lady "to come out straight with policy ... can be perceived as too harsh. And then I'm a black lady coming out with policy? So — let me try a garden. Let me start there." Obama said she realized that addressing childhood obesity, which was connected to the garden, "was a thorny issue." The challenge was how to approach parents about "what they are doing wrong ... without being accused of being the nanny state." Asked about her famous statement at the Democratic National Convention in 2016, "When they go low, we go high," Obama says it's still her belief, despite that even some Democrats feel it's out of step with the current political climate. "What's the alternative?" she asks. "Are we all just gonna go low? Are we all just gonna be in the mud, kicking and screaming and hating and wreaking havoc and fear?" She reflects briefly on the politics of today, saying that change takes time and that we are still moving forward. "I am making my mark in hopes that my grandchildren will experience something better than I did, just as my parents laid down markers so that my life would be better than theirs. We don't fix things in a lifetime," she says. "There have been harder times in our nation's history than this." As for what comes next in her career, Obama says once her book tour is completed, she intends to continue work on The Global Girls Alliance, an initiative she launched to promote girls education around the world. She also wants to spend some time listening to what people get from her book. "That will help shape my steps, because what's the need? ... I'm figuring that out as we go," she says. "I don't even know who I'm going to become at 55 years old. We are gonna see what unfolds, because it is a process."